Most of us have our favorite causes to which we devote time, energy and often money. One of mine is The Colorado Trail, a 500-mile Denver to Durango hiking trail that was built by and is maintained by volunteers. With the launch of Needlepaint .com, I decided that the Colorado Trial logo would look great on a custom needlepoint pillow and would made a wonderful door prize that the annual Christmas party in Golden, Colorado. 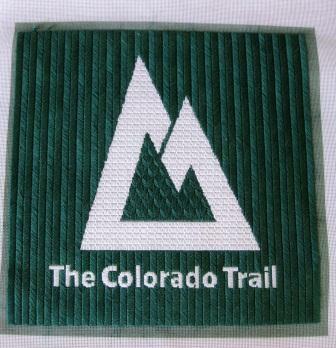 The logo is a simple stylized green mountain on a white background. Maybe a little too much white for a pillow? This was a perfect project for something other than the traditional continental stitch. The lettering was done in an embroidery-styled satin stitch, working where possible with vertical and horizontal stitches to cover the canvas completely. The white mountain was done in the Shingle stitch, the green center of the mountain in Leaf #3 stitch, and the background in Giant Knitting from The Needlepoint Book by Jo Ippolito Christensen. The pillow was finished with matching green cotton piping and backing over a 10-inch polyester-filled form from JoAnn Fabrics . The finished pillow made it to the 2009 Colorado Trail Christmas Party. It was not given away but auctioned off bringing in $200.00. 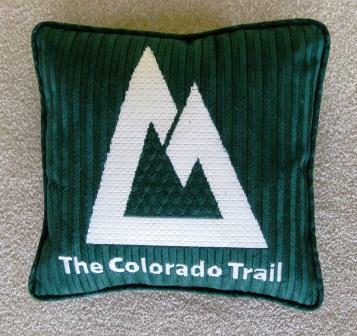 In 2010 another Colorado Trail volunteer came forward to needlepoint a second pillow which was also auctioned. We may have started a tradition. Why not do it for your favorite group? 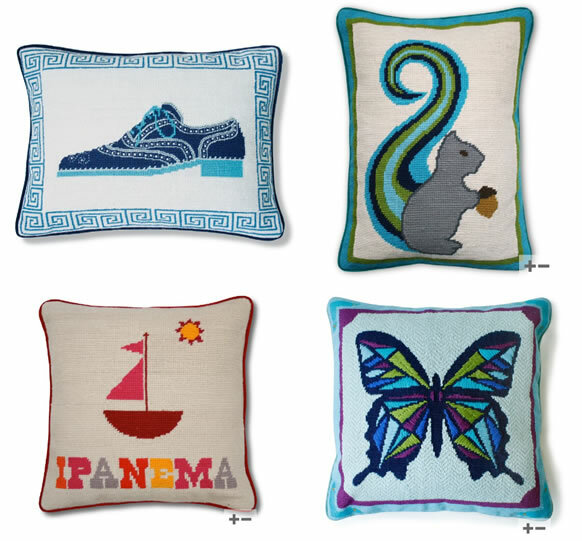 I went into a Jonathan Adler store a few months back, and the pillows there still stick out in my mind. I love them! Attached are a few of my favorites, but what is great for needlepointers, is that you can use these ideas to create your own custom needlepoint kit. Look below to see what I designed. I could imagine lots of ways this could go. Kids names, lake names, or your city name! As far as pillows go, we don’t supply pillow kits yet, but I do have some website links that are very helpful. Another suggestion I have, is to follow Jonathan Adler’s lead, and use velvet for the back. Anybody who wants help designing a pillow, I’d be happy to talk and do the design that you want, free of charge if you are buying a kit! Our phone number is on our website. 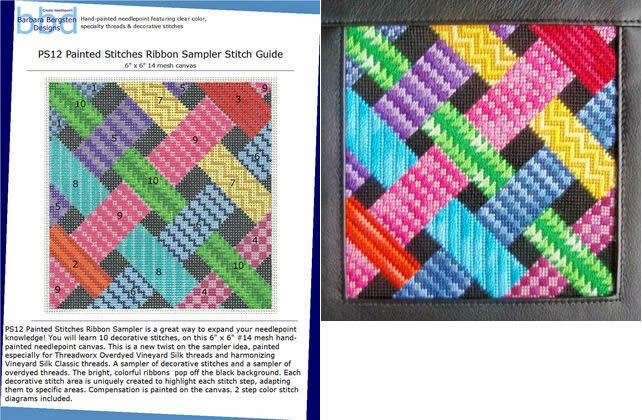 Barbara Bergsten Designs has posted a PDF file showing her newest needlepoint stitch guide on her blog. I believe you can purchase her guide kits through needlepoint retail stores, of which she has a list, and many have websites. But, the FREE PDF file looks great for people who would like to learn new types of stitches. Check it out! Coming up with cool ideas for needlepoint kits is not always easy. As great designs come in, I’m always amazed how creative people are! 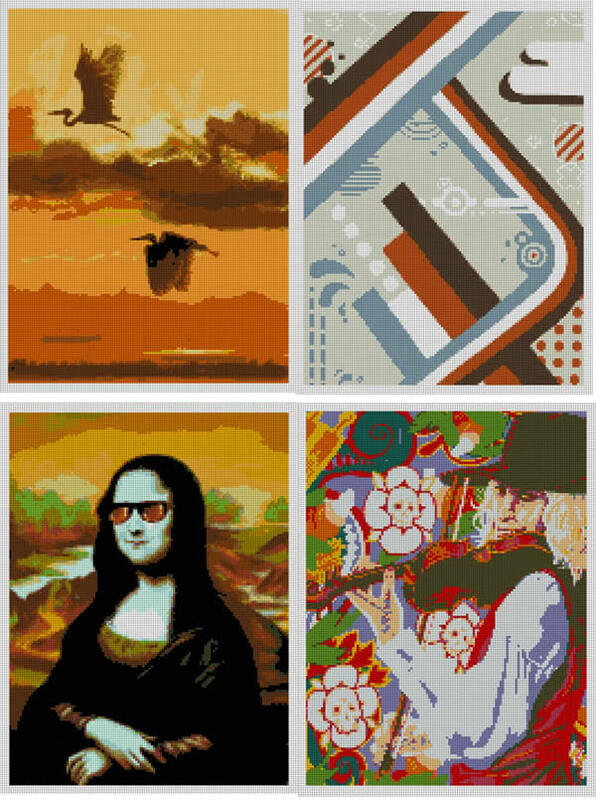 From my side, I’ve always appreciated the internet for its ability to help spur great ideas, so going forwards, as we come across fantastic websites for needlepoint designs, we’ll put them in a specific category called ‘NeedlePaint Inspiration’. 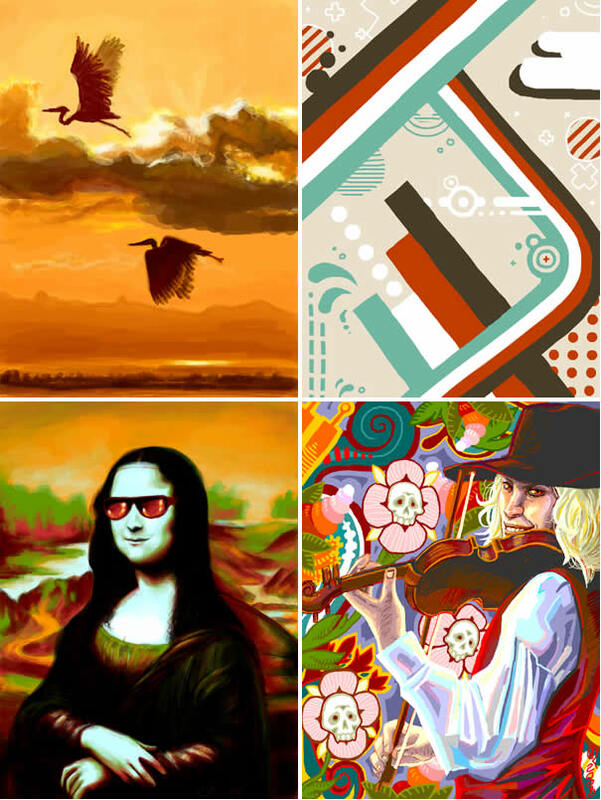 I recently found a pretty fun website where artists put up their work, it is very modern and fun. http://tewi.us/tegaki/ I found this site via Mr X Stitch’s contemporary needlecraft blog. Also, we’ve had some traffic coming from Sprite Stitch, which is a website that people can show their love of stitching and older video games. This site Tewi.us, is almost all animated images, so I pulled out a few colorful ideas to try on NeedlePaint. The canvases came out really well, I did 12″ high, with 14 mesh, and all the kits use below 20 colors. 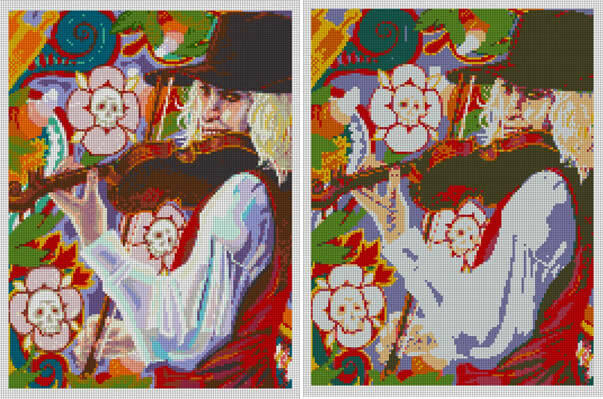 Left Image has 40 colors, right has only 11! 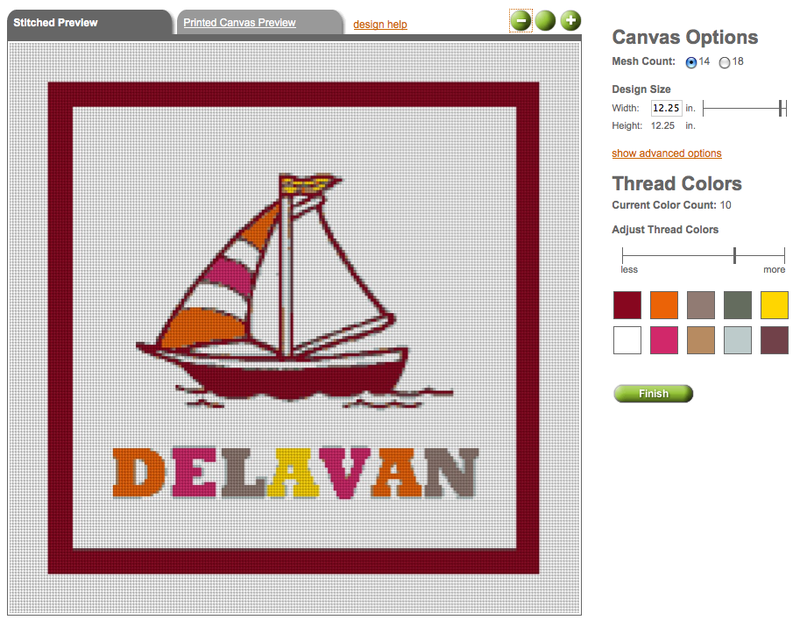 I was inspired by one of our customers beautiful needlepoint kits. 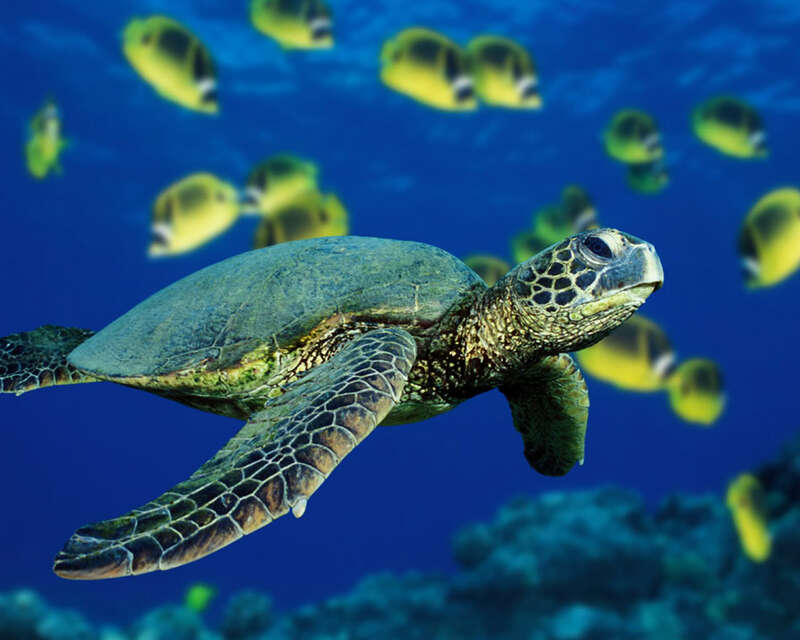 It was a beautiful turtle, gliding in the ocean, and the image came out amazing. I’m hoping that once they finish the canvas, they will send us images, but in the meantime, I went looking for some pictures to see how it would turn out. I decided to stick with NeedlePaint’s recommendation, and left the size, color, and canvas mesh as original, and look how good it came out! 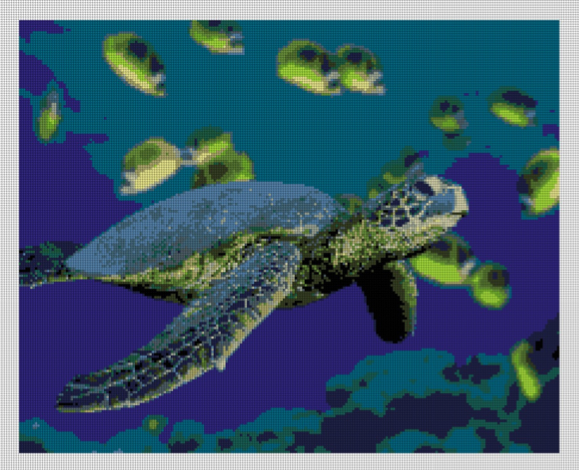 Preview of a NeedlePoint Turtle! There are lots of opportunities for new projects. Just pick your favorite animal, and do a google image search.